North American area code 480 is a telephone area code in Arizona serving the eastern and northern portions of the Phoenix metropolitan area. It was created on April 1, 1999, in a three-way split of area code 602, when it was apparent that the Valley of the Sun was growing too fast for it to remain entirely in one area code. Generally, 480 is coextensive with the East Valley, while most of the West Valley is area code 623 and most of Phoenix itself remained in 602. By the turn of the millennium, 602 was running out of numbers just four years after all of the state outside of the Valley of the Sun was split off as area code 520. Original plans called for 480 to be an overlay code for the entire Phoenix metro area. However, overlays were a new concept at the time, and met with considerable resistance due to potential geographic ambiguity, as well as the requirement for ten-digit dialing. A three-way geographic split was chosen instead, with 480 assigned to the East Valley. 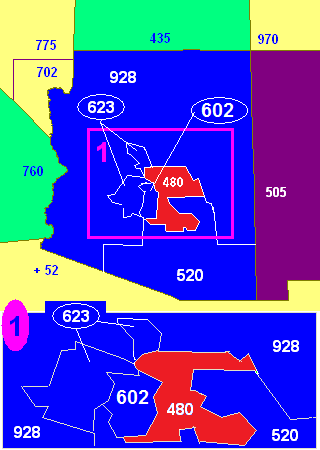 The 480 area code encompasses Scottsdale, Paradise Valley, Fountain Hills, Tempe (except for a small portion west and south of the I-10 Broadway Curve, which stayed in 602), Chandler, Gilbert, Mesa, Queen Creek, Apache Junction, as well as far northeast Phoenix and the Phoenix neighborhood of Ahwatukee, and newer unincorporated communities in far northwest Pinal County that are becoming part of the Greater Phoenix metropolitan area due to heavy development. Also in area code 480 are pagers for the Iridium satellite telephone service. As of October 2018, area code 480 is expected to reach exhaustion by the first quarter of 2025, but as of February 2016, there is no relief plan in place. ^ "2018-2 NRUF and NPA Exhaust Analysis - October 2018" (PDF). This page was last edited on 2 November 2018, at 01:18 (UTC).